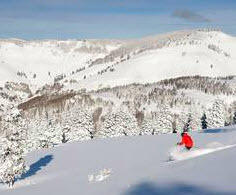 Tours de Sport Hot Deals: SAVE FROM 20-30% AT THE ANTLERS AT VAIL WHEN YOU BOOK BY OCTOBER 15TH! SAVE FROM 20-30% AT THE ANTLERS AT VAIL WHEN YOU BOOK BY OCTOBER 15TH! "Big Savings" at the Antlers at Vail - Save up to 30% off regular wholesale rates when you book by October 15th. Our friends at the Antlers are at it again! They want us to incent you to get your Vail visit planned NOW, while it's still available. Don't miss this great opportunity to stay at one of Vail's best locations. You'll enjoy a fabulous stay and save some green as well!!! The Antlers at Vail Condominium and Conference Center is renowned for its friendly atmosphere and has an A+ location on Gore Creek and the Vail bike path just 150-yards from the Vail Gondola, Vail Ski School, A $20 million expansion was finished just a few years ago and includes new condos/lodging units, a brand-new lobby with courtyard entrance, new conference facilities, exercise room, new pool area, business center, and heated parking. Not long ago, the Antlers at Vail hotel was awarded the Vail Valley Business of the Year. Make the Antlers at Vail your home away from home, while you enjoy a great lodging experience in the relaxed mountain setting of Vail Colorado. If you prefer, contact your sales representative at 888-754-2167 for assistance & additional details.